The “Enchanted Islands” of Galápagos are found in the Pacific Ocean, 926 kilometres west of Ecuador. 720 km to the North is Cocos Island and to the south is Easter Island and San Felix Island at 3,200 km. The Galápagos archipelago is composed of 13 main islands, 7 smaller islands, and many rocks and islets. The islands and their surrounding waters form an Ecuadorian province. There are many wonders to discover in the Galápagos both above and below the water. Its geographical location at the confluence of three ocean currents makes the Galápagos one of the richest marine ecosystems in the world. Ongoing seismic and volcanic activity reflects the processes that formed the islands. These processes, together with the extreme isolation of the islands, has lead to the development of unusual and rare plant and animal life. In 1959, 97.5% of the archipelago’s total surface (7,665,100 ha) was declared a National Park and in 1978, UNESCO designated Galápagos as the first World Heritage site. The Galápagos are home to some of the highest levels of endemism (species found nowhere else on earth) on the planet. About 80% of the land birds, 97% of the reptiles and land mammals, more than 30% of the plants and more than 20% of the marine species seen in Galápagos are endemic. Favorites include the giant Galapagos tortoise, marine iguana (the only lizard to swim in the ocean), flightless cormorant, red footed booby, and the Galapagos penguin — the only penguin species to be found in the Northern Hemisphere. The indigenous animals are unusually tame due to lack of predation and many years of protection, making a visit to Galápagos such a memorable experience as you really will have up close encounters with the wildlife. The Charles Darwin Foundation (CDF), an international non-governmental organisation (NGO) constituted in Belgium, whose core responsibility is to conduct research and provide research findings to the government for effective management of Galápagos, was also founded in 1959. The Charles Darwin Research Station was established on Santa Cruz Island in 1964. Originally the research station personnel conducted the conservation programmes to protect the native species but now much of the work is completed by the Galápagos National Park based on findings and methodologies developed by the CDF. The islands are also surrounded by the Galápagos Marine Reserve which was created in 1986 (70,000 km2) and extended to its current area (133,000 km2) in 1998, making it one of the largest marine reserves in the world, second only in size to Australia’s Great Barrier Reef. The volcanic islands of Galápagos are known as the unique “living museum and showcase of evolution”. The islands were made famous by the studies of Charles Darwin that became his Theory of Evolution by natural selection following his visit in 1835. There are airports on two islands (Baltra and San Cristobal) which receive flights from continental Ecuador (mainly from the capital Quito and the city of Guayaquil) with another airport on Isabela generally limited to inter-island traffic. Visits to the other uninhabited islands are strictly controlled with carefully planned tourist itineraries limiting visitation. Around 30,000 people live on the islands, and approximately 170,000 tourists visit the islands each year. The Galápagos straddles the equator, with islands in the chain located in both the northern and southern hemispheres. Volcán Wolf (the highest point at 1,707m above sea level) and Volcán Ecuador on Isla Isabela are directly on the equator. Española Island, the southern-most islet of the archipelago, and Darwin Island, the northern-most islet, are spread out over a distance of 220 kilometres. The largest islands are Isabela, measuring 5,827 km2 and making up almost three-quarters of the total land area of the Galápagos, Santa Cruz, Fernandina, Santiago and San Cristobal. Human settlements are restricted to zoned rural and urban areas on four islands only. A fifth island has an airport, tourism dock, fuel containment, and military facilities. The archipelago is located on the Nazca Plate (a tectonic plate) and also sits atop the Galápagos hotspot where the Earth's crust is being melted from below by a mantle plume creating volcanoes. The first islands formed here at least 8 million and possibly up to 90 million years ago, the oldest islands having already disappeared below the sea, whilst the youngest islands, Isabela and Fernandina, are still being formed. Most of the islands represent the summit of a volcano, some of which rise over 3,000 metres from the Pacific floor. The larger islands typically comprise of one or more gently sloping shield volcano, culminating in collapsed craters or calderas. Long stretches of shoreline are only slightly eroded. In many places faulting and marine erosion have produced steep cliffs and lava, coral or shell sand beaches. Other features include crater lakes, fumaroles, lava tubes, sulphur fields and a great variety of lava and other ejects such as pumice, ash and tuff. The Galápagos archipelago has been described as one of the most unique, scientifically important, and biologically outstanding areas on earth (UNESCO 2001). It is many a traveler’s, nature lover’s, scientist’s, scuba diver’s and snorkeler’s dream to visit the Galápagos to see the islands’ interesting history and volcanic geology, as well as its richly diverse and unique flora, fauna and marine life. Many travelers describe their time on the islands as a life-changing experience. There are 116 visitor sites in the Galápagos: 54 land sites and 62 scuba-diving or snorkeling sites. Small groups are allowed to visit in 2–4 hour shifts only to limit impact on the area. All groups are accompanied by licensed guides. 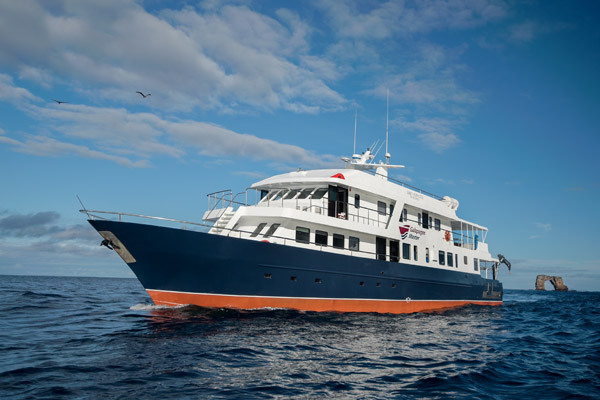 For scuba divers we recommend liveaboard diving in the Galápagos as most land based dive operators do not go as far as Wolf and Darwin Islands where the best diving encounters can be had and many of the best dive sites are inaccessible by land based operators. Includes the Tortoise Quest Tour which begins with a trip to "Los Gemelos" (The Twins) - two enormous collapsed lava chambers - followed by a visit to a 600-acre private reserve where the giant Galapagos tortoises freely roam, graze and sleep. You will also have time to explore the town of Puerto Ayora – walk, bike or go shopping. See their wild sceneries where human and the wildlife interact in perfect harmony. Begin the journey on Santa Cruz Island, where you can observe the simbiosis between lava, endemic plants and fauna. Visit the highlands of Floreana where you will learn about the island’s history. Continue your adventure to Isabela, the iconic seahorse shaped island. Enjoy the diverse and rich fauna of endemic and native species such as Penguins, Blue Footed Boobies, Marine Iguanas, Flamingos, Pelicans, Sally light foot crabs abound, and countless fascinating underwater creatures. Hike to see the rim of volcanic craters and across lava fields, sea kayak by the cliff shores searching for sea birds, whales and dolphins. Snorkel in the crystal clear turquoise waters where you may see sea lions, green sea turtles, white tipped reef sharks and countless tropical fish. Relax on a beautiful white sand beach. Diving and adventure tours can also be arranged. Longer stays also visit the Charles Darwin Research Station and Tortuga Bay on Santa Cruz. Quito and Surroundings – including the charming capital city and the Equatorial Monument, the traditional Saquisili Market, Cotopaxi (volcano) National Park, Otavalo indigenous market, Cuicocha Crater Lake and the Cotacachi-Cayapas Reserve. Guayaquil – including a yacht tour of the Guayas River, city tour and a drive through the coastal countryside with a visit to a coco and banana plantation and a hacienda. Cuenca – located in Ecuador’s southern Andes mountains, a historical city listed as a UNESCO World Heritage Trust site with many historical buildings and pre-Colombian ruins in the vicinity by the Tomebamba River. The Galápagos Islands can be visited during all times of the year. Although located on the Equator, the weather is not tropical. The islands' climate is determined by ocean currents. Annual rainfall in the lower regions is 2-4 inches (60-100mm). Weather and precipitation changes as altitude increases and will also vary based on the location of the island. April & May and September & October are often considered to be low season months. From June to November the southern trade winds bring the colder Humboldt Current north to the Galapagos which produces thermal inversions that impede rainfall. At this time, a fine mist called “garúa” is formed as cool, moist air just above the water meets a higher layer of warmer air. The highlands of the larger islands are kept green and lush while the sea level islands and shorelines have little rainfall, just a light misty drizzle. It is also quite windy so the seas tend to be rougher. The cold current also brings water rich in nutrients and plankton. There are more fish in the sea at this time of year, and hence, also more seabirds searching for these fish. Albatrosses arrive on Española in June and stay until December. Penguins also like the cold water and the abundance of fish. On Genovesa, the elusive owls mate in June and July, and you have the best chance of spotting one during this time. You can also witness the blue-footed boobies beautiful mating ritual known as the "sky point." Humpback whales can be seen particularly around the islands of Bartolomé and Española from July to September and whale shark sightings are also greater during the dry season. The air temperature averages between 21ºC to 27ºC during the cooler, dry season and the water temperature ranges from 16ºC to 24ºC. The warmer waters of the southern flowing Panama Current head towards the Galapagos again around December when the southern tradewinds die down. Between December and May is considered the "warm season" when the Galapagos' climate is more tropical with daily, sporadic rain. The heaviest rain falls between January and April. It is also the sunniest time of the year and when the ocean is at its calmest and visibility is at its best. The ocean temperature is warmer for swimming, snorkeling and diving. The air temperature averages between 24ºC to 32ºC during the warmer season and the water temperature ranges from 21ºC to 28ºC. This is the breeding season for land birds and you may see some unusual mating rituals. Sea turtles nest on the beach, and from March through May, you can often see land tortoises searching for mates around the lowland areas of the islands. Sea lions also mate in the rainy season and around March and April, you'll be able to see the adorable newborn pups crawling around the islands. There are larger schools of Hammerhead Sharks, and more Manta Rays and Eagle Rays encountered during this season. El Niño is a phenomenon that occurs roughly every 5-7 years. The southeast trade winds slacken and cause the sea temperatures to rise dramatically. There is also a rise in sea level, greater wave action, storms, heavy rainfall and a depletion of nutrients in the water. The sudden climatic change caused by El Niño can be devastating and as many as 50% of sea lions and marine iguanas can die during this time. El Niño usually begins in December and can last a few months. The Galapagos Marine Reserve is an underwater wildlife spectacle. The sheer abundance of life is amazing. No other site in the world can offer the experience of diving with such a diversity of marine life forms that are so familiar with human beings that they accompany divers. On any given dive you are likely to see sea lions, turtles, hammerhead sharks, white tip sharks, manta rays, Galapagos sharks and huge schools (sometimes between 50-100) of eagle and/or golden rays. There is also the possibility of seeing whales, whale sharks, thousands of dolphins and large schools of hammerheads, sometimes numbering in the hundreds. Between dives you can snorkel with penguins or walk right up to a 400 pound tortoise. Darwin and Wolf Islands are probably two of the best dive sites in the world, and is where you’ll have the best chance to see whale sharks (in season) and schools of hammerheads. It takes approximately 15 - 20 hours of open ocean travel each way to reach them as they are located very far to the north (almost 200 km from the nearest island) and no land excursions are possible up there. These itineraries are not appropriate for non-divers as they will have very few land excursions available and will not visit as many of the islands as a trip which does not include Darwin and Wolf. Divers visiting the Galapagos should have experience with cold water diving and diving in strong currents and surge. Visibility ranges from 10–25 metres and currents are medium to strong, ranging from 1 to 5 knots. Drift dives are common. Descending currents are often encountered and blue water safety stops are the norm requiring good buoyancy control. Surface conditions can be choppy. Most divers are comfortable with a 7mm wetsuit from June to November with a hooded vest and gloves, and a 5 mm wetsuit from December to May. Gloves and hood are strongly recommended. The dives start near the famous Darwin Arch. Surface conditions and current can make diving here a challenge but you are likely to be distracted by the schooling hammerheads, spotted eagle rays, prowling Galapagos and silky sharks, an abundance of bigeye jacks, mackerels and turtles. Between June and October you may also encounter whale sharks. Warmer water species such as trumpetfish, trevally, barracuda, parrotfish, angelfish, surgeonfish and racoon butterflyfish can be found at Darwin Island. During your safety stop you may be joined by frolicking sea lions and dolphins. Pods of bottle-nose dolphins, playful sea lions, rays and turtles are often spotted from the dive boat before you even enter the water. Wolf Island has 3 distinct dive sites. Moray eels hide amongst the boulders and rubble that litter the seabed. However out in the blue is where the action is. See if you can spot the tuna, glasseye snapper, turtles, hammerheads and Galapagos sharks cruising in the distance, whilst the schools of eagle rays come in for a closer look. Apart from the abundant marine life, the underwater topography here makes this dive even more fascinating. There are a series of swim-throughs and a cave to explore. As you exit you may be greeted by hammerheads, white tip reef sharks, eagle rays and Galapagos sharks circling around you. At the end of the dive, drift amongst an engulfing melee of fish life before your safety stop. One of the best sites for diving with the inquisitive and playful Galapagos sea lions. As you plunge further down the rocky slope, keep an eye out for scalloped hammerheads in the blue. Galapagos and silky sharks in breathtaking numbers are also predominant here. Yellow fin tuna, pelican barracuda, the reflective African pompano and eagle rays are likely to come into view. In the shallows, a lone hammerhead may surprise you whilst you are watching the concentration of reef fish around you. Located on the northwest tip of the island of Isabela, the water temperature at this site can be quite chilly. Here you will see a diverse range of creatures different to other sites in the Galapagos including Mola Mola or Pacific Ocean Fish, Red Lipped Batfish scuttling across the ocean floor, seahorse, Galapagos penguins and the rare horn shark (Galapagos bullhead shark). There are plenty of ledges and crevices to explore in the reef wall. Keep an eye out for morays, spider crabs, slipper lobsters and cleaner shrimp. Above water you can see Flightless Cormorants, Blue Footed Boobies, Frigate Birds and Brown Pelicans. Located off the northeast tip of Isabela island, this is where you should be on the look out for the graceful Giant Manta Rays. If the mantas choose not to put in an appearance you will still be entertained by white tip reef sharks, creole fish, barracuda, yellow fin tuna, grouper, snapper, turtles, fur seals and sea lions. Other rays to look out for are mobula rays and schools of cow-nose rays. A favourite dive for the variety of things to see. This site is located off the east coast of Santiago (north of Bartolome Island). The volcanic rock is covered in black corals, small hard corals, sea fans and red sponges. Hiding amongst the coral and ledges/overhangs are Galapagos seahorse, octopus, frogfish, hawkfish and many nudibranchs. There are also opportunities to see plenty of bigger animals as well – Galapagos, hammerhead and reef sharks; mantas, marble rays and spotted eagle rays; schools of barracuda, green sea turtles, snappers and grouper. Watch the sea lions as they chase salema fish during your safety stop. A land based programme may be preferable for divers who suffer from seasickness or who need a more flexible stay when traveling with non diving partners and friends. These can combine diving and island excursions such as snorkeling, kayaking and hiking to see the wildlife and to experience the Galapagos Islands’ natural beauty and culture. 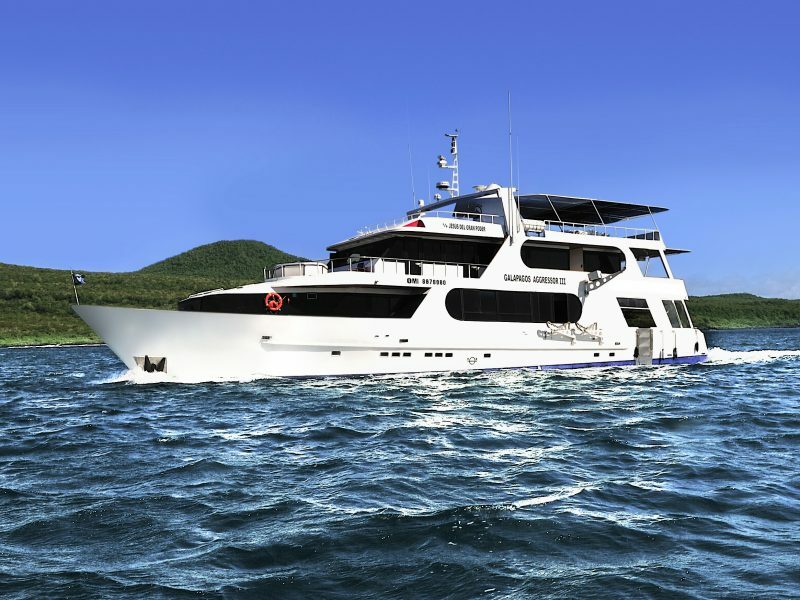 These land based dive packages focus on dive sites around Santa Cruz and Isabela islands. The Galápagos Islands are found in the Pacific Ocean, 926km west of Ecuador. 720km to the north is Cocos Island and to the south is Easter Island and San Felix Island at 3,200 km. The international country code for Ecuador is +593. Galapagos is 6 hours behind Greenwich Mean Time (GMT). Citizens of Australia, New Zealand, Japan, the EU, Canada and the USA do not require visas for stays up to 90 days. Residents from some African and Asian countries require visas. Check with your closest Ecuadorian Consulate for current entry requirements. Yellow fever is present in Ecuador (excluding Galapagos Islands). Some airlines require passengers to present a valid yellow fever vaccination certificate before being allowed to board flights out of the country. Malaria and other insect-borne diseases (incl dengue fever, Chagas' disease and leishmaniasis) are a risk in provinces below 1,500m. Ensure you have had vaccinations for Hep A, Hep B, tetanus, typhoid and rabies if planning to travel through Ecuador. Outbreaks of diarrheal diseases can occur. Be mindful of acclimatising to high altitudes. Please check with your physician for the best precautions to be taken. The currency of Ecuador is the US Dollar. Visa, Mastercard and Diners credit cards are most widely accepted by larger hotels, stores and restaurants but expect a transaction fee. Checked baggage allowance will depend on airlines flown and the departure point of individual tickets. Please check allowances for each airline / ticket separately. 3 litres of alcoholic beverages per family. 400 cigarettes, 500 grams of tobacco and 25 cigars. Although located on the equator, the weather is not tropical. The cooler, dry season extends from June to November when the air is misty and the winds are stronger. Fish life is abundant and there is a greater chance of whale shark encounters. The warmer, more tropical season is between December to May. This is mating season and also hammerhead and manta ray season. Average temperature ranges from 21 - 30ºC throughout the year. Cover yourself decently when visiting cities. Swimming trunks, bikinis and other beachwear are acceptable at coastal resorts. Bring long pants and long sleeved shirts for protection against mosquito and sand fly bites. Warmer clothes are required if visiting the highlands and for the cool season. Sun protection is absolutely essential. Ecuador uses 120-volt AC at 60 hertz cycles. Plugs are type A and B, same as USA and Canada. Some electrical outlets are still the 2 prong type so bring a converter. (For further details refer to http://www.iec.ch/worldplugs/ ). ATM’s are the easiest way to get cash. Make sure you have a 4 digit PIN - longer PIN’s are not always recognised. Bring small USD bills as change can be hard to get. Banking hours are Monday – Friday 9am to 4pm. Some banks close from 2-4pm and some open Saturday from 10am-12pm. Spanish is the official language of Ecuador. Indigenous languages such as Quichua are also widely spoken throughout the country. Shuar is common in the Amazon basin. It's best to come to Ecuador with a basic knowledge of Spanish. The dominant religion is Roman Catholicism. Ecuador exercises religious freedom. Many of the Indian tribes took on Catholic rites and have mixed them with their own traditional, indigenous beliefs, creating a form of worship called Folk Catholicism. Always drink bottled water in Ecuador. Avoid tap water unless it has been boiled, filtered or chemically disinfected (iodine tablets). Shopping malls are open Monday to Friday 10am–8pm and Saturdays 8am–9pm. Local stores have shorter opening hours. Bargaining is acceptable in markets and small shops but tourist stores usually have fixed prices. Most restaurants include 10% service in the bill. It’s common to give your waiter another 5% directly if the service merits it. Taxi drivers don’t expect tips. Porters / bellboys are tipped 25c - $1 per bag. Tips for your guide, driver, cook, crew are greatly appreciated and expected. Ensure that all equipment is serviced and in working order prior to departure. You will need to bring a DIN converter for DIN regulators. 5-7mm wetsuits are recommended (check season) plus gloves, booties, hood, surface marker buoy and dive computer. Dive operators supply tanks, weight belts and dive guide services. There will be an extra charge if equipment hire is required. A Galapagos National Park entrance fee, Transit Card and Hyperbaric Chamber Fee applies. There are currently no locally paid departure taxes (subject to change).